The second edition of Simple Fly Fishing will feature a new cover design by artist Dwight Hwan, eight new fly designs in full color, added stories and instructional illustrations by renowned fish artist James Prosek, plus a quick setup guide for tenkara. The revised 2nd edition lands in Patagonia stores in December and will include a limited number of autographed copies. 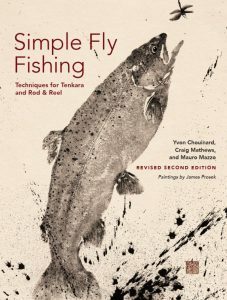 It will be sold nationally in fly shops and bookstores starting January 19, 2019. YVON CHOUINARD, a noted fly fisherman (chosen by Fly, Rod, and Reel as “Angler of the Year” in 2009) and environmentalist, is the founder and owner of Patagonia, Inc. He cofounded, with Craig Mathews, 1% for The Planet, a group of businesses giving back to the environment. A bestselling author, Simple Fly Fishing is his third book and first release in the hunting and fishing genre. He lives in Ventura, California, and Moose Jaw, Wyoming.